The L.T.S Durabeam and Unilam series of glue laminated beams are difficult to ignite. Glulam burns very slowly and resists heat penetration by the formation of a layer of charcoal. This char forms a layer of insulation which keeps the encased limber cool, even though the fire's temperature may be over 1000ºC. As a result, a large beam, which has been designed to support its design load in even the severest of fires, will maintain its strength. Also, glulam does not expand or deform enough to push out supporting walls. Metals on the other hand soften very quickly, lose all effective strength and then expand sufficiently to push out supporting walls before collapsing completely. While wood will burn the larger sizes of wood products, such as glued laminated timber, burn more slowly than smaller size dimension lumber and this is taken into account in design. concealed spaces under floors and roofs and requires the use of approved fastenings, construction details and adhesives. The performance of heavy timber construction under fire conditions is markedly superior to most unprotected non-combustible structures. Fire fighting is simpler and safer due to elimination of concealed spaces and the inherent structural integrity of large glued laminated timbers. at least one full hour after the fire starts. Fire tests sponsored jointly by AFPA and AITC have Ied to the development of a fire design methodology which allows the designer to calculate a specific fire rating for a glulam member. This information is available from the American Institute of Timber Construction. 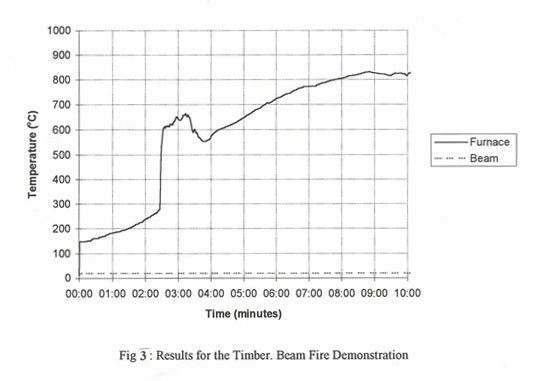 Please contact your AITC laminated timber supplier or AITC and ask for "Glulam Performance Under Fire Exposure," and AITC Technical Note # 7 "calculation of Fire Resistance of Glued Laminated Timbers." Most are surprised when Heavy Timber construction is compared with other structural building materials' fire resistant properties. Unprotected metals lose their strength quickly and collapse suddenly under extreme heat. 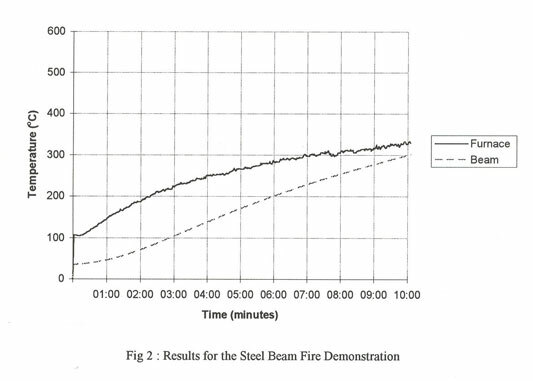 Steel weakens dramatically as its temperature climbs above 450 degrees Fahrenheit, retaining only 1O% of its strength at about 1380ºF (average building fire temperatures range from 1290ºF to 165OºF). Wood retains a significantly higher percentage of its original strength for a longer period of time, losing strength only as material is lost through surface charring. Typical glulam beam following test. Note that the outer surface of beam has charred, while inner areas remain unburned. The charred outer material acts as an insulator during fire, reducing the rate at which the inner material will burn. The fact that large wood structural members provide a substantial degree of fire endurance was recognized as early as 1800 when heavy timber framing assumed importance in the design of factory buildings. When a group of cotton and woolen mill owners organized in 1835 for mutual protection of their property from damage by fire, this system of construction increased in prominence and became identified as "mill construction." The outgrowth of this organization was the formation of what is now known as the Associated Factory Mutual Fire Insurance Companies. A long history of over 150 years of excellent performance in numerous severe ires has established the superior fire endurance of heavy timber framing. The term, "mill construction," originally applied to this type of building, has gradually disappeared in favor of the more definite term, "heavy timber construction," as now recognized in major building codes throughout the country. With the advent of modern structural glues and gluing techniques in recent years, the engineered timber fabricating industry has greatly expanded the scope of architectural application for "heavy timber construction." Originally used for factories and warehouses, it has also become a preferred method of construction for churches, schools, and other places of assembly. There are many outstanding examples of this new method of timber framing which utilizes glued-laminated structural members in a variety of sizes and shapes to fit a broad range of architectural forms. For many years, heavy timber framing has been considered a preferred risk by fire insurance rating bureaus and a superior type by fire protection authorities. The records include numerous examples in which buildings of heavy timber construction have been restored to use at minimum expense after severe fire exposure. In many cases, removal or char by sandblasting or other means was the only repair work needed. The char which forms on timber during a fire is an effective insulator which protects the inner section of timber from the effects of heat. 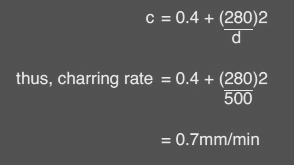 At a distance of 20mm from the edge of the char, the internal temperature of the wood will only be about 80ºC. At this temperature, the beam will retain 80% of its tension and compression strength, and 95% of its stiffness (modulus of elasticity). This contrasts with other structural materials such as unprotected steel I-beams. 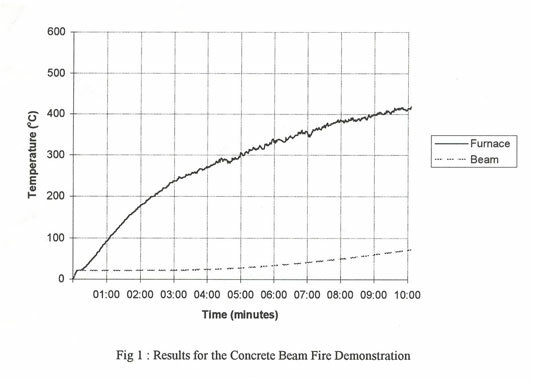 Comparative fire tests of timber and steel showed that a steel I-beam deflected 900mm after 30 minutes' exposure to a standard fire, while a glue laminated timber beam of the same load-bearing capacity deflected only 60mm. The thermal expansion of timber is minimal and in practice is usually overshadowed by shrinkage due to loss of moisture. Timber is therefore unlikely to cause structural damage through thermal expansion. "Most firefighters, especially the older ones familiar with timber construction, would prefer to enter a timber frame building to fight a fire within it, than a similar building constructed in unprotected steel, because the collapse of a timber structure is apparently more predictable than a steel one. We believe that a fire engineered approach to the incorporation of timber within building construction is feasible arid should be pursued".